My dogs are scattered across North America, with a great many living in the United States. In fact, I have been exporting pups from Canada to the U.S, almost since I began breeding, more than 15 years ago. Most states have at least one SwissRidge canine citizen! 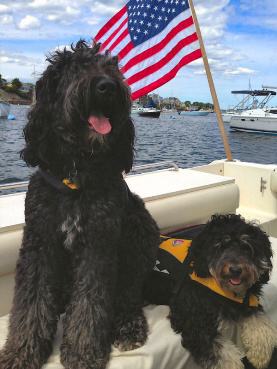 Demand in the U.S. has grown since word got out about the Bernedoodle. It’s not idle bragging to say there are simply no breeders to compare where the Bernedoodle is concerned. As the originator of this hybrid, I have more than a decade’s experience behind me, and yet it continues to be a challenging hybrid to produce. Breeders following behind me have a ways to go before they catch up. After reading my book, visiting my Facebook page, and connecting with current owners, aspiring owners of SwissRidge pups make their deposit and join the waiting list. When their pup is finally born, they start counting down the days till they can bring home their pup at the age of eight weeks old. It has always been a relatively simple matter for American residents to import young puppies. Effective August 11, 2014, the process has changed and there is now an additional step before importing puppies at 8 weeks of age. Previously, the CDC routinely authorized admission of pups into the U.S. prior to rabies immunization providing the owner entered into a dog confinement agreement. A dog confinement agreement stipulates that puppies are to be confined in the owner’s home until fully immunized, unless they are muzzled and leashed. For many years, my clients signed the form and imported their pups without a problem. Now, clients must e-mail an application to CDC to request approval for a dog confinement agreement. If you want to import your puppy before they are four months of age, the process is to fill out this application https://www.cdc.gov/importation/forms.html and send the application to [email protected]. I suggest applying for a confinement agreement 3-4 weeks before your pup is scheduled to go home. Typically, the CDC can take 2-14 business days to process a request. While the CDC has the option to decline a confinement agreement and require that people wait until the puppy is vaccinated against Rabies, to date, all requests to import a puppy at eight weeks of age have been granted. The process is very simple. Many of my clients have decided not to apply for early import and are choosing to leave their puppies with us until they are 4 months of age, fully immunized, and started in training—including crate training, house breaking, commands such as sit, down, come, walking on a leash, puppy manners and socialization. A young puppy is cute, but very hard work! Regardless of the CDC changes, people are increasingly choosing to bypass the stress of early puppy training. With that in mind, please consider the options below . You may actually prefer your pup to arrive in the U.S. at 4 months of age—fully vaccinated and able to go out into the world with you. No imprint program. Import your puppy at 8 weeks. Apply for CDC approval when the puppy is around 6 weeks old. Enrol your puppy for one month in the SwissRidge puppy Imprinting Program (described below). Import your puppy into the US at 3 months of age. You must apply for CDC approval when the puppy is around 2.5 months old. Enrol the pup in the SwissRidge puppy imprinting program for two full months. No CDC application is required as the puppy will be fully vaccinated against rabies. Note: All pups who remain with us in any program will receive their regular puppy vaccines free of charge for Distemper, Hepatitis, Parvo and Parainfluenza at the ages of 8, 12 and 16 weeks and their rabies vaccine at 3 months (if staying until 4 months) free of charge. A value of $210. I recommend either 1 month imprinting, or two full months of imprinting if you can afford the added fee. A pup that has experienced imprint training, especially for two months, will have a significant head start in life. When it comes home, it will be quite advanced for its age. Our Imprinting Program has grown in popularity in recent years, as people realize how much easier it is to bring home a puppy that is crate trained, walking on a leash, well-mannered and on track with learning basic commands, such as “come,” “sit,” “down,” and “stay.” Approximately 60 per cent of my clients leave their pup for the one-month training program with rave reviews; the two month program will bring even better results. Leaving a pup for imprinting may not have been part of your initial thinking, but I can assure you that you will not be disappointed in the results. The SwissRidge Imprinting Program can catapult owners over the toughest part of the adjustment to life with puppy. Please check out the many testimonials for Imprinting under the Training menu tab. gain an understanding of commands, such as “sit,” “down,” “come,” “stay,” and walking on a leash. The majority of puppies in this program go home knowing basic commands and are typically accident-free in the crate. Although every puppy is different and some may not be mature enough at this age to fully master commands, early imprinting will lay the foundation for later obedience training and help the puppy learn very quickly once it is in your care. There are usually other puppies and adult dogs on site, so your pup will continue to learn bite inhibition and manners from good teachers: other dogs. If you are worried about missing the critical bonding period with your pup, don’t be. Puppies are primed to bond long beyond the first 16 weeks of their lives. I have highly trained pups going home at 6-8 months that bond quickly and thoroughly with their owners. Your pup will readily adapt to its new life when it joins you, and you’ll easily master obedience training with the foundation already in place. With 1 month of imprinting, puppies cover the basics: learning their name, “sit,” “down,” “come,” walking on a leash, crate training and house training. Most pups will be doing all the commands with a treat. They will have a good grasp on potty training, but they may still have accidents. With 2 months of imprinting, pups will begin to learn “stay,” and will move on to doing commands with hand signals. They will walk nicely on a leash without pulling and be nearly accident-free on the housebreaking front. In both the 1 and 2 month sessions we socialize pups to different things around the house, people and children, and teach and reinforce puppy manners, such as no jumping, biting, chewing. At around 12 weeks, pups become extremely nippy—one of new owners’ chief frustrations. In imprinting, they not only learn bite inhibition from us, but also from other pups. Each puppy is unique, and some will grasp things more quickly than others. Regardless, there is no question that imprinting will make life a lot easier for you when the pup comes home. You will not be up all night, or taking them for potty breaks every three hours. It’s essential to begin formal obedience classes as soon as your pup comes home, so that you reinforce everything we’ve taught the puppy. SwissRidge already has some experienced—and very patient—trainers on board and will hire more as needed. Puppies will live with the imprint trainers in their homes, where they will be socialized to a variety of stimuli—sights, sounds, other dogs, children—in a safe, controlled environment. Our resident expert trainer, Lucas Mucha, is working closely with the imprint trainers to ensure a consistent approach with all puppies that aligns with the overall SwissRidge training philosophy. As you can see from my recent newsletter and new website, we have been planning to expand training services at SwissRidge for some time. The imprint component will just need to expand a little earlier than we expected! Rest assured that we will carefully monitor all pups in their boarding or imprinting environments. The welfare of my pups is always my highest priority.